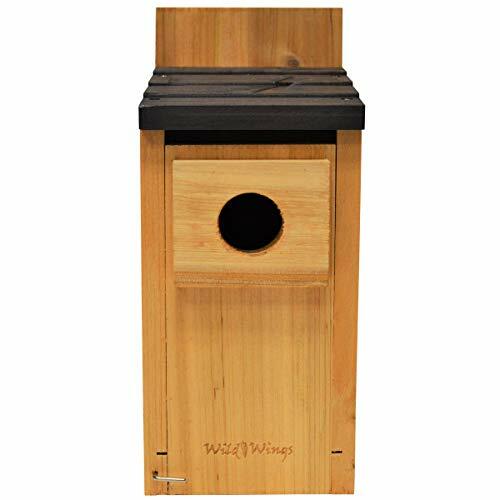 Nature's Way Bird Products CWH1 Cedar Wren House, 8" x 8.875" x 8.125"
Bring nature to your own window and see details of your favorite bird species that you've never been able to see before! This large see-through bird feeder mounts on your window so that you can watch your favorite neighborhood birds up close! Both the removable tray and main feeder now have drain holes so the seed can dry in the event of rain or snow. You can be proud to give this bird feeder as a gift. The unique artwork on the box this feeder comes in will instantly impress your friends and family. Install and cleaning instructions are also located on the back of the box for the recipient's convenience.  INCLUDES OUR LIFETIME STRONGEST SUCTION CUPS GUARANTEE. Providing exceptional quality products and top notch customer service is our #1 Priority. We promise you that your Nature's Hangout bird feeder will never fall down, or we'll provide you with a full refund! You can click the yellow Add to Cart button today with confidence- knowing that you are getting the best window bird feeder! 2BTH001 Features: -Garden. Animal Type: -Bat. Birdhouse Design: -Mounted. Birdhouse Style: -Cottage. Color: -Brown. Material: -Wood. Dimensions: Overall Height - Top to Bottom: -13.5". Overall Width - Side to Side: -9". Overall Depth - Front to Back: -5". Overall Product Weight: -1 lbs. We offer a wide variety of garden decor items! Bluebird box house is made with premium cedar so it's naturally insect & rot resistant. This particular design attracts bluebirds & tree swallows. Air vents allow for maximum air ventilation through wall & Floor openings. Clean-out door provides easy access for cleaning. An elevated mesh Floor aids in the management of blowfly. A predator guard extends the entrance hole to protect young Birds against predators. Two predator guards are included: one measures 1-1/2" for eastern bluebirds, while the other measures 1-9/16" for western bluebirds. An addition of fledgling serfs provide extra grip for fledglings to climb out. The innovative design can be installed with a pole mount or flush mount. Innovative design technology is combined with superior quality for ease-of-use & long-lasting durability. 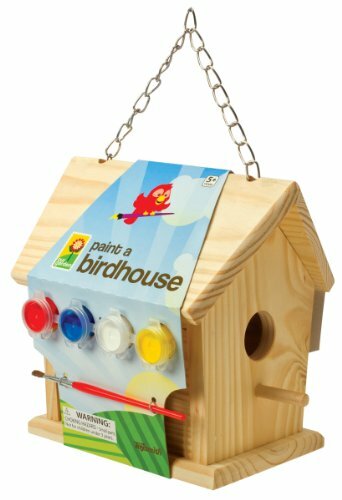 Each wooden birdhouse comes with four paint pots, 5" paint brush and a link chain for hanging. House stands 6 1/2" tall. 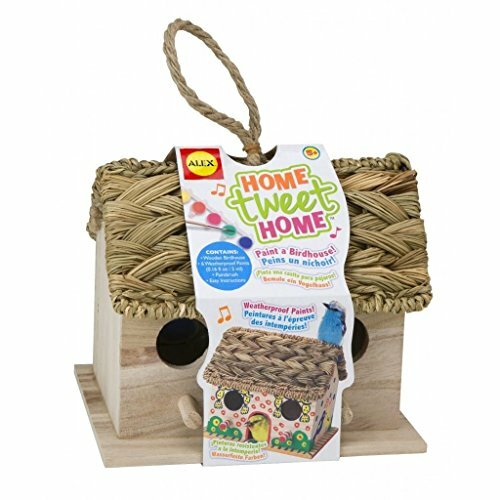 Give those little guys a place of their own with the Perky Pet Wren Bird House. 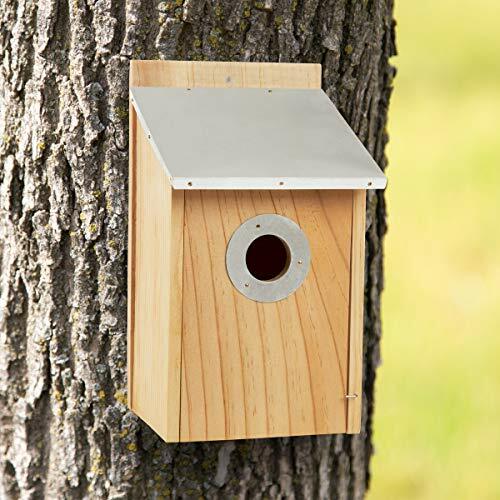 This small-scale bird house is ideal for wrens and other small nest cavity birds. It's handcrafted of weather-resistant cedar that weathers beautifully and naturally repels insects. This house stands 6.5-inches high and has a 2-inch hole for entry. The hanging rope is included. About Woodstream A privately held company with a long-standing positive reputation, Woodstream is a global manufacturer and marketer of quality products from pets and wildlife control, and home and garden products, to bird feeders and garden decor. They have a 150-year history of excellence, growth, and innovation, and have built a strong presence in key markets through organic growth and strategic acquisitions. The growth of Woodstream is thanks to their customer-driven approach to product development, a dedicated design organization that focuses on innovation, quality, and safety, as well as a commitment to an industry-leading level of service. Dimensions: 7L x 8W x 6.5H inches. Ideal for wrens and other small nest cavity birds. Handcrafted of non-endangered timber. Cedar is aromatic and naturally weather-resistant. Cedar is also a natural insect-repellent. 2-inch hole for bird entry. Hanging rope included so it's ready for use. Dutch style roof for an adorable look. Enjoy watching them make a nest! Bees are nature's best friend, as most plants and flowers depend on pollination from bees. Bees are by far the most prolific pollinators on our planet. A single native bee can contribute to several thousand blooms per day. Many species of bees make their home in preexisting insect holes and crevasses in trees so they will be naturally drawn to the bamboo tubes in your SKOOLIX bee house. Excellent for providing a nesting place in the spring and summer, and as a refuge in the autumn and winter. 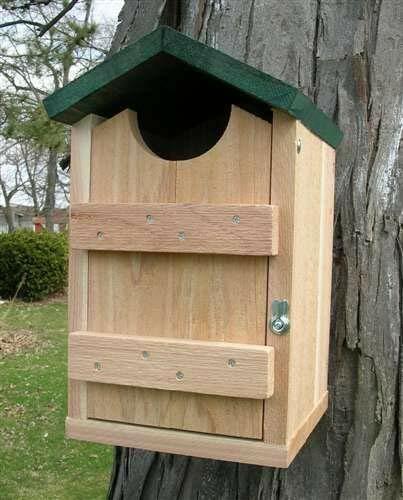 Many other bee houses are made from the typical bird house design and wood from the standard hardware stores. 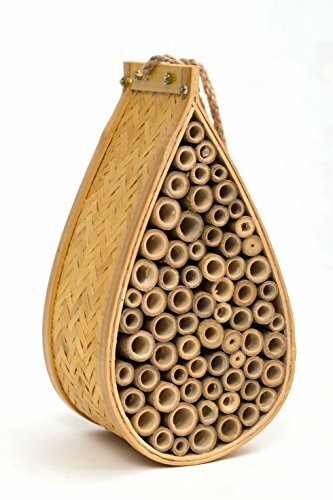 Your SKOOLIX Bee House is made from high quality natural bamboo with a unique rain drop design that would look perfect in any yard or garden. Also comes equipped with eco-friendly hanging rope that is better on your branches and provide greater flexibility for hanging in tight spots than your typical metal hanging hooks. Help supports the natural habitat of these bees as it is the best way to boost productivity in your yard or garden. You will notice better blooming flowers and vegetables that will multiply like never before. ATTRACTIVE DESIGN: Decorative rain drop style that will look wonderful in any yard or garden. Bee House dimensions - 4 x 10 x 6 inches(10.2 x 25.4 x 15.2 cm) , 2 pounds (.91 kg). LIGHTWEIGHT & VERSATILE: Product comes complete with a 6 inch (15 cm) rope hanger that easily loops to any tree branch or garden stake. ECO-FRIENDLY: Handcrafted from natural bamboo with approximately 70 cylinders of nesting tubes. Other Bee Houses are made with commercial paper tubing, your SKOOLIX Bee House is constructed with natural bamboo that is much more effective for attracting bees. Left outdoor this product will generally last 2 years. BOOST GARDEN PRODUCTIVITY: Perfect for attracting bees into your garden or backyard that will help pollinate your plants and ensure better blooming flowers yearly. Cost effective and natural alternative for a greener environment. ATTRACT MORE BEES: Help save the Bees, support natural habitat of the dwindling Bee population. Bee hotel provides a safe environment for wildlife insects to nest, shelter, hive and lay eggs. Ideal for female bees and other beneficial insects. 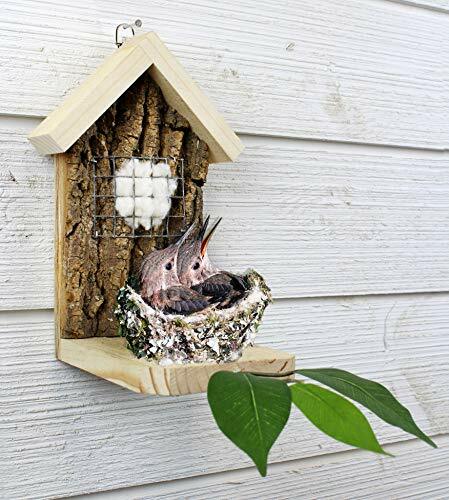 Uniquely crafted and designed birdhouse will accent your home or garden. Wonderful gift for any bird or nature lover. Includes jute cord for hanging and removable clean-out plug on the bottom. 7"W x 6"H, hangs 18". Measures: 7W x 6H, hangs 18. Fully Assembled, No other hardware required. Attract song birds with a house built for two that you paint yourself. Has a real thatched roof. 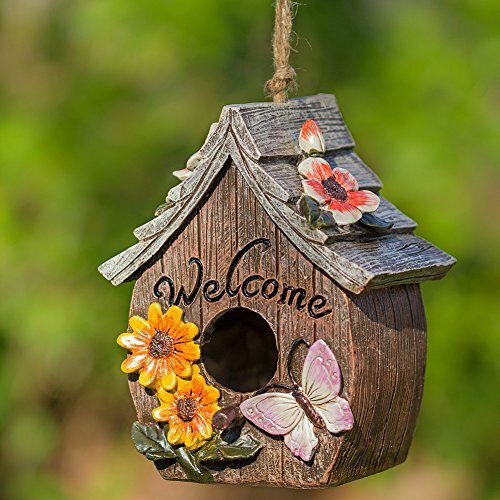 Hang this birdhouse proudly in your garden! Includes 6 weatherproof paints, paintbrush and easy instructions. 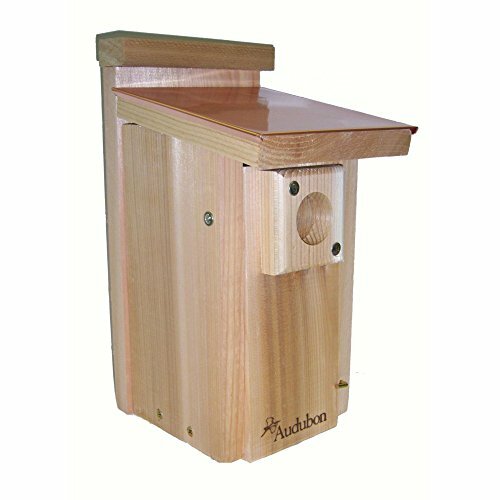 Built to Audubon specifications, the Wood Link Coppertop Bluebird House offers safe shelter to bluebirds. Handcrafted from cedar, this house has one entry hole and is topped by a copper roof. Dimensions: 7.25W x 9D x 13.5H in.. Constructed from cedar wood. Natural wood finish. Contains 1 entry hole; 1.5625 in. diam.. Mounted design. Intended for bluebirds. Copper constructed roof. Dimensions: 7.25W x 9D x 13.5H in. Contains 1 entry hole; 1.5625 in. diam. Uncle Dunkels Backyard Hummingbird Nester provides a fun, exciting place for bird lovers to watch Hummingbirds nest and raise their babies! Our custom nesters are made in our woorkshop in Kentucky, by our team of experienced artisans. They are crafted with attention to detail and have many details which differentiate us from other hummingbird nesters. Authentic Poplar tree bark and rot resistant wood. Our Poplar tree bark acts as a natural attractor to hummingbirds and has been ethically sourced from previous wste product. It has been flattened and kiln dried to kill all invasive pests, making our nester perfect for shipping anywhere in the U.S.
Includes Hanging Hook Makes for Easy Installation. The ideal place to hang the nester is under an eave, or covered porch out of the wind and preferably near your hummingbird feeder. 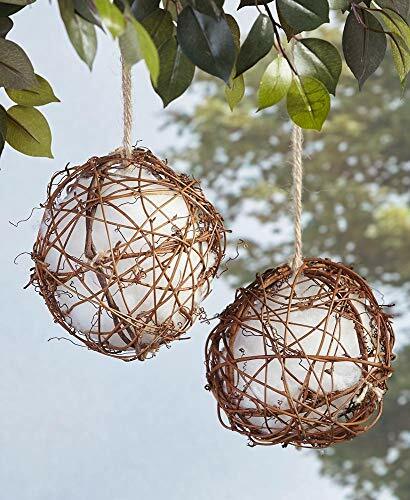 The nesting cup (the hole which is cut ou in the floor of the nester), as well as the wooden support posts, gives the hummingbirds a sturdy support for their nest. The limbs and the leaves are attractive to the hummingbirds as they provide a place for them to land. The Gilbertson Bluebird House is a must-have for serious bird enthusiasts! Order one or more for your backyard or order a bigger package to share with your bird-loving friends. Whether you are looking to add or replace your current nesting boxes in your backyard, the Gilbertson Bluebird house is the perfect choice! 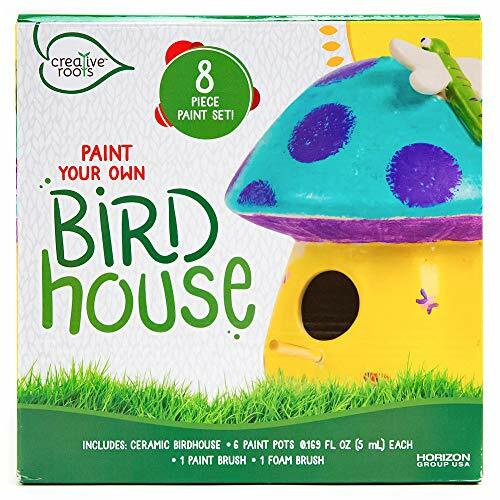 Crafted with durable weather resistant material, this PVC bird-house with poly recycled plastic roof will not fade, warp, or crack giving you many seasons of brood watching right in your backyard. The Gilbertson-style nest is well-known for it's well thought out shape. The tube shape paired with the coloring of this birdhouse represents the look of a tree. This is very attractive to the Bluebird species! Sparrows are a chief competitor to many birds. This Gilbertson Bluebird house is the most sparrow-resistant nesting house on the market! Although not fully Sparrow proof, it has been proven to have the least desirability to them when compared to any other nesting box design. What makes Sparrows not attracted to this bird-house? The Gilbertson birdhouse has a 9/16" circumference entry hole and it is 4 1/2" deep from the bottom of the entrance hole to the floor. Two features that are to the disliked by the sparrows! Sit Back & EnjoyMount one or more nests in your backyard, sit back, and enjoy! This birdhouse is sure to attract a family of birds to nest in your backyard. Give the perfect gift to your birdwatching friends and you will have endless conversations about each other's nests. Select the number of nests that you want and click "Buy Now" to order and start housing bluebird broods right in your backyard! BIRD-WATCHING MADE SIMPLE: Sit back and enjoy bird watching from the comfort of your own backyard by installing Bluebirds favorite bird nest. 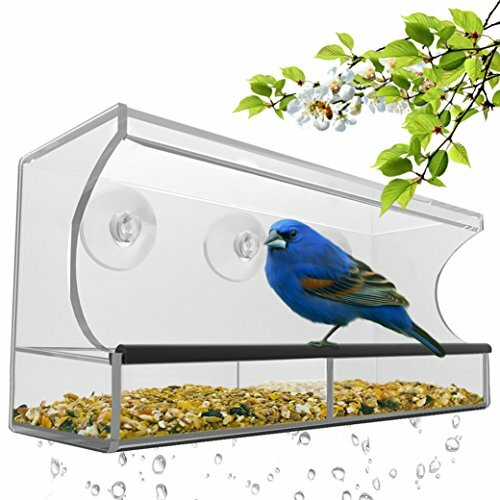 SPARROW SAFE: Sparrows are a big competitor for small birds such as the bluebirds. This bird nest is the most sparrow-resistant bluebird house on the market. Crafted with a shallow drop and a small nesting cavity that is not attractive to the sparrows. CHARMING AND FUNCTIONAL: Crafted to look like the trunk of a tree, this bird-house is made with grooves on the inside to help young birds climb out and a darkened interior to imitate a nest cavity. DURABLE: Made from durable PVC pipe with a poly recycled plastic roof top. Screech Owl House (Set of 1). 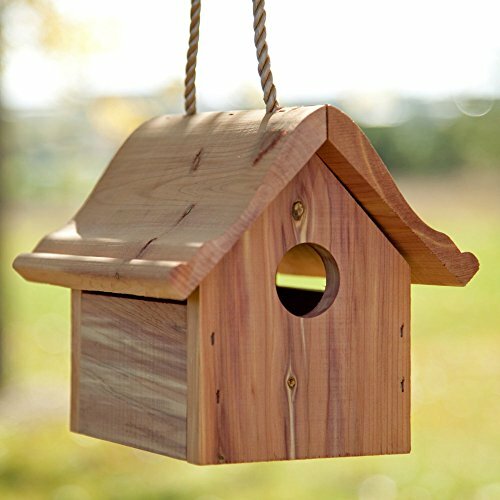 Bring the charm of nature and beauty of songbirds to your own backyard with the Pure Garden Pine Birdhouse. 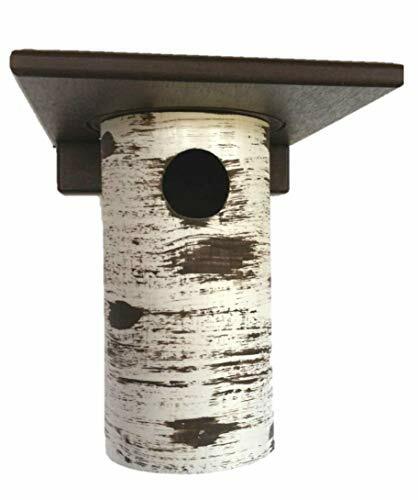 This classic outdoor accent is made from all-natural materials with no harmful chemicals along with a latch that keeps the box safely closed for birds. Additionally, it features a tin, no-perch roof to prevent large birds or predators from resting on top. The traditional bird house can be left with the natural pine look or can be painted for a customized feel to fit your style. It is sturdy and durable and comes with weatherproof mounting screws to securely attach it to any tree trunk, the side of the house, or you can even sit it on a flat surface. The nesting box comes fully assembled with 3 predrilled holes for convenient, and easy installation. It is perfect for nature lovers, outdoor enthusiasts, or bird watchers to create your own personal outdoor oasis by attracting bluebirds, chickadees, wrens, and more! SATISFACTION - Pure Garden is committed to providing the consumer with the absolute best price and value on our entire line of products, which we ensure by applying a rigorous quality control process. 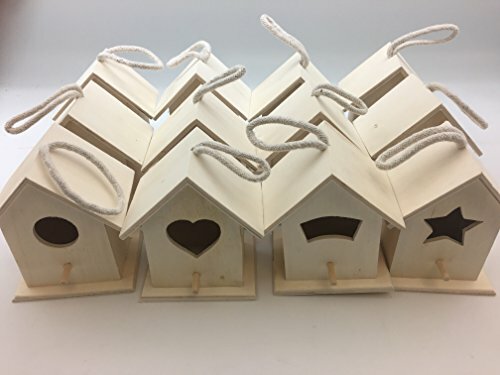 NOTE: This is an exclusive product of Pure Garden and ONLY Bird Houses by Pure Garden are to be genuine IMPORTANT: Avoid buying counterfeit products and transacting with unauthorized sellers. Look for our logo on the packaging for every one of our products. 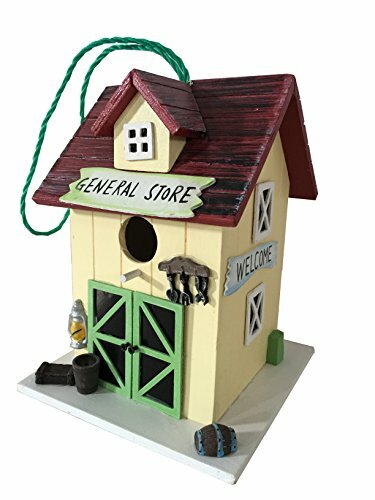 Classic Outdoor accent- this traditional wood birdhouse is a perfect addition to any garden or outdoor area to attract charming songbirds such as bluebirds, Wrens and more to your backyard. The box can be left Natural or painted for a personal touch. 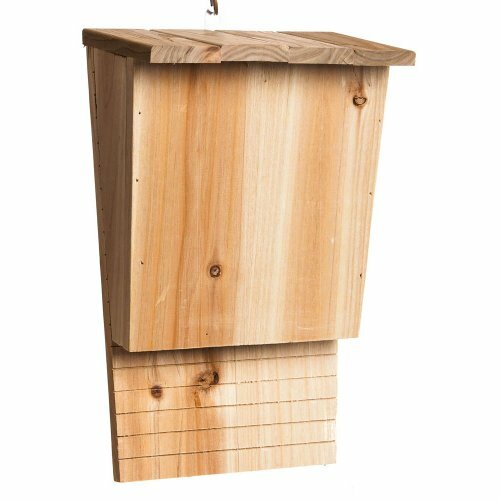 All natural and safe- this nesting box is made from all-natural pine with no harmful chemicals and features a no-perch tin roof to prevent large birds or predators from resting on top. It also contains a Clasp to keep the front door securely closed. 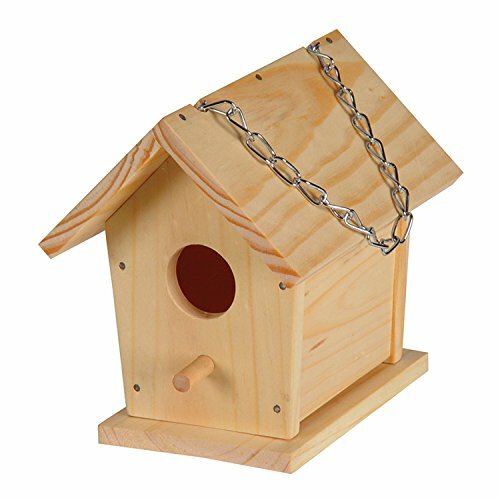 Durable build- the durable bird house has a solid build and sturdy construction. It can be securely mounted with the included Weatherproof zinc screws to any tree trunk, side of a building, or even rest on a flat surface. Easy installation- the nest house is already fully assembled and ready to mount for convenience. It comes with all necessary hardware, instructions, and 3 pre-drilled holes for simple installation and has an easy open front for effortless cleaning! Product DETAILS- Dimensions: 6 W x 11 H x 6 depth, tin roof- 6. 25 W x 6 depth, hole- 1 3/8. Material: pine wood, tin. Includes 3, 2 zinc screws for mounting and instructions.